Senior sprinter Caitland Smith has been named the Sun Belt Conference Female Track Athlete of the Week, the league office announced Wednesday. Smith owns the Sun Belt top mark in the 60-meter dash thus far with a time of 7.45 seconds coming at the A-State Kickoff Klassic last month. That time is converted from her 6.91 second 55-meter dash inside First National Bank Arena. Last weekend at the Jim Green Invitational hosted by the University of Kentucky, Smith ran the 60-meter dash in 7.49 seconds, the third-fastest time in program history. Smith also leads the Sun Belt Conference 200-meter dash performance list. A converted time of 23.72 seconds from the Kickoff Klassic. Last weekend she finished second in a competitive field at the Jim Green Invitational with a time of 24.12 seconds, the third-fastest time in program history. A-State track and field heads to Birmingham for the Samford Invitational on Friday. The Red Wolves return to First National Bank Arena for the A-State Invitational on January 25. 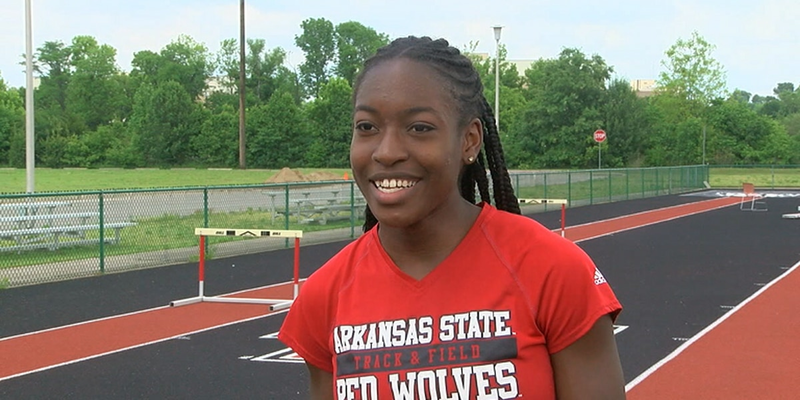 For the latest on the A-State track and field, log onto the team’s Facebook page at Facebook.com/AStateTrackAndField or follow the team on Twitter at @AStateTrack.